On 7 February 2019 Friends of the Orangutans contacted Tripadvisor to ask that they stop the sale of tours to the Sepilok Orangutan Rehabilitation Centre on their website and their subsidiaries. We have explained to Tripadvisor the reason for this request in a letter sent to them, which can be viewed here in full. In January last year photos and reports showing the eye-watering treatment of orangutans and other animals at Kemaman Zoo in Terengganu made headlines in the media. The conditions seen in the reports were not new though. Animals at Kemaman Zoo have been kept in poor conditions for years and despite receiving flak a year ago it appears so far that little has changed at the zoo. When Kemaman Zoo was exposed last year Perhilitan, the wildlife department, dismissed all allegations of poor welfare of animals at the zoo. In contrast, the Malaysian Association of Zoological Parks and Aquaria (Mazpa) took action and suggested improvements to the zoo and we thank Mazpa for being transparent and sincere with their findings. Since then the zoo has made minimal changes at both orangutan enclosures but they are still insufficient to meet the intricate needs of captive orangutans. According to a June 2018 news report a stunning RM 60 million had been spent on expanding a state owned zoo which is reportedly bleeding money. How much was spent to upgrade the existing shoddy state of animals? The latest photos we received, which have been verified, show the continued substandard welfare conditions for orangutans with no sign of an enrichment programme in place. Kemaman Zoo has two enclosures for its orangutans. The indoor enclosure consist of large and smaller concrete cages and they are almost barren and there is nothing for the orangutans to do. 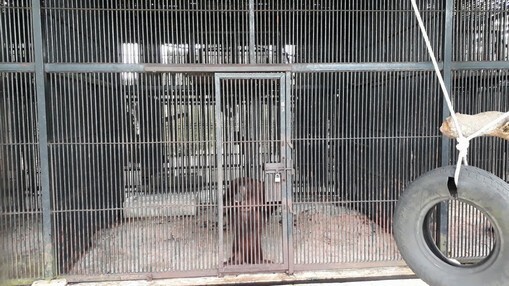 The sight of the orangutans in the cages is a disgraceful one and will leave any zoo visitor to wonder why in this day and age Malaysia still keeps orangutans in such manner. Orangutans are intelligent animals and poor captive situations like at Kemaman Zoo can lead to psychological and physical problems. The outdoor enclosure needs to be worked on. We have been informed that it tends to flood when the zoo is inundated with rain water, which may occur more often during the monsoon season in the east coast of the Peninsular. A staff at Kemaman town council (Majlis Perbandaran Kemaman) claimed in confidence that there is no proper moat drainage at the outdoor orangutan enclosure. We will leave for state officials to comment on this. 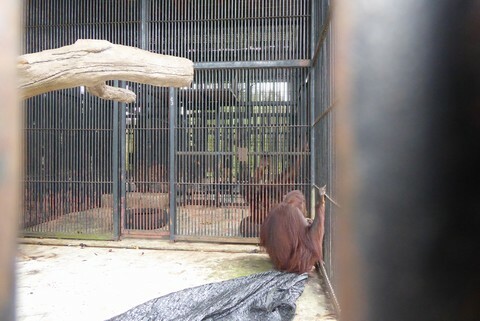 When the outdoor enclosure is overwhelmed with water it is dangerous to let the orangutans out, and this leaves them spending more time in the cages. 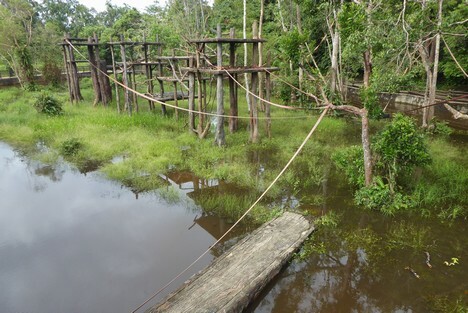 Water moats as barriers should be avoided in the first place as it increases the risk of drowning, which happened to an orangutan at Lok Kawi Wildlife Park, Sabah in the past. All our emails to state officials and the zoo last year were not replied to. In June Terengganu menteri besar Dr. Ahmad Samsuri Mokhtar welcomed assistance for the zoo and despite this state and zoo officials never responded to our offer to meet and help. Clearly the welfare of animals is not a concern of top zoo and state officials responsible for the zoo. The sorry state of our orangutans and other wildlife at Kemaman Zoo needs to change. Instead of spending more money expanding the zoo and importing animals the state should spend on improving welfare of existing animals. We urge the public to boycott this zoo until vast changes have been made. We also ask KATS Minister Dr. Xavier Jayakumar to help the animals. Photos: Malaysian Friends of Animals. Used with permission. Friends of the Orangutans Malaysia has published a press release to bring to light the clearing of forests in Papua New Guinea by a vcompany owned by a Malaysian family. Satellite images showing continued clearing in the palm oil company’s development area available at this link. Four photos in the same link courtesy of Global Witness. You have permission to reprint the press release below and use the satellite images and photos. Please credit Global Witness for the photos. PRESS RELEASE, 30th August 2018 – Company owned by Malaysians clearing PNG forests. A palm oil company owned by a prominent Malaysian family is threatening Papua New Guinea’s unique forest ecosystem and is presenting a serious risk to palm oil industry sustainability policies, according to NGO Friends of the Orangutans Malaysia [FOTO]. The Bewani Oil Palm Plantations Limited [BOPPL], headquartered in Vanimo, Papua New Guinea, has cleared an estimated 25,000 hectares of forests including an estimated 12,000 ha in the last four years since obtaining a lease for the palm oil development project in 2010, claims FOTO. “BOPPL obtained a lease for almost 140,000 of forests eight years ago. These are pristine rainforests are made up of primary and secondary forests. Destroying forests for palm oil or any other agricultural crop is unacceptable and must stop”, says NGO director Upreshpal Singh. FOTO adds that BOPPL holds a Special Agricultural Business Lease, or SABL, which is an agricultural lease given out to developers by the PNG government on behalf of customary landowners. In 2013, a report by the PNG Commission of Inquiry into the Special Agriculture & Business Leases found widespread abuse, fraud and lack of accountability and transparency, among others, in the awarding of SABLs in the country. The commission report, which accused BOPPL as a company with a “chequered history”, also recommended that its SABL be revoked. In early 2017, PNG’s Prime Minister Peter O’Neill announced that all SABLs in the country had been declared illegal and that they should be revoked, while earlier this year a PNG online news portal reported that BOPPL’s lease had been cancelled following a court decision due irregularities in the awarding process of SABLs , though this was contested in a major PNG newspaper owned by Malaysian logging giant Rimbunan Hijau. FOTO adds that despite the uncertain legal status of BOPPL’s operations the company had continued to clear forests and satellite images show that clearing was taking place as of July this year. The company plans to plant 20,000 ha of oil palm trees by 2020 . BOPPL is owned by nine members of the prominent Malaysian Tee family, who are also shareholders of eight palm oil mills in Peninsular Malaysia. These mills appear in the supply chains of companies with sustainable purchasing policy commitments including Sime Darby, IOI, PepsiCo, Nestle, Unilever and others. FOTO wants traders buying from the palm oil mills owned by the Tee family to immediately suspend purchases and demand the latter to stop clearing on their BOPPL plantation in PNG. “The palm oil industry is undergoing a shift since the last few years as more and more companies adopt sustainability policies and remove deforestation from their supply chains. That many of these companies are still buying palm oil from mills owned by individuals active in forest clearing undermines these sustainability policies and attempts to combat deforestation in the industry”, concludes Upreshpal. Despite the uncertain legal status [of BOPPL’s lease as mentioned above], in June 2018 the National Planning & Monitoring Minister Richard Maru visited the plantation to review developments. He heard that the Bewani Oil Palm Plantation plans to plant 20,000 ha of palms by 2019, and the mill is currently undergoing tests before it is commissioned. Papua New Guinea’s Prime Minister Peter O’Neill will officially commission the mill. One question that remains is how the Tee family are funding this venture. With an investment cost of around RM30,000 per hectare for infrastructure and costs to maturity, the capital needed for a plantation of this size are significant. The Bewani Oil Palm Plantation is owned by nine members of the Malaysian Tee family; Tee Kim Tee, Tee Cheng Hua, Tee Lip Jen, Tee Lip Chuan, Tee Chain Yee, Tee Lip Sin, Tee Lip Hian, Tee Ching Chan and Tee Cheng Hu. The project’s inauguration in October 2010 was attended by Tee Kim Tee, who publicly signed inauguration documents at the event. The Tee family are also the majority shareholders of four palm oil mills (Tagar Properties, Rompin Palm Oil Mill, Prosper Palm Oil Mill and Endau Palm Oil Mill) and the minority shareholders of four other mills (KilangKosfarm, WujudWawasan, Kilang Sawira Makmurand Cheekah-Kemayan Plantations) in Peninsular Malaysia.These mills appear in the supply chains of companies with sustainable purchasing policy commitments, including Wilmar, IOI, Musim Mas, Bunge, Mewah, ADM, Sime Darby, AAK, Cargill, Colgate Palmolive, PepsiCo, Reckitt Benckiser, General Mills, Mondelez, P&G, Nestle, Olam, Mars and Unilever. The Tee family’s shares in these eight mills are via several intermediary companies, commonly known as the Prosper Group of companies, and their mills typically appear in company supply lists as ‘Prosper Group’, or a variant of Prosper. The Prosper Group’s publicly listed plantation entity, Far East Holding Berhad, has two main shareholders: Prosper Trading Sdn Bhd and LKPP Corp (Pahang State’s Company for Agriculture Development). Tee Kim Tee & Tee Cheng Hua are currently non-independent, non-executive directors of Far East Holdings Bhd, and minority shareholders. Tee Cheng Hua is also on the senior management team of Far East Holdings Bhd as Executive Director Plantations (as per the 2017 annual report). Family members Tee Lip Jen, Tee Kim Tee, Tee Cheng Hua, Tee Lip Chuan, Tee Chain Yee, Tee Lip Sin and Tee Lip Hian are also majority shareholders in Prosper Trading Sdn Bhd. We appreciate your concerns of the animal welfare and we assure no such misappropriate actions were done to our animals as the company has heavily invested to build zoos with proper licence obtained from the authority, obliging in conserving the wild life and adhering to any rules and regulations from the local authorities under the wildlife 2010 Act / Act 716. The allegations on Sumomo, the 19-year old Chimpanzees being shot dead is not true. All relevant technical reports have been submitted to the investigation team from Jabatan Perhilitan Negeri Kedah. A press statement was also post in the social website to share the news transparently. The press statement is attached. We recently had Perhilitan and MAZPA representatives visited and audited our Chimp’s enclosure & exhibit and we are glad all had met the requirements with minor additional or changes that has been addressed immediately. On the post-mortem report of the dead chimp sadly to say we cannot provide to public or any other parties as a full report was submitted to Perhilitan. We hope the explanation will provide a peace of mind to you and parties concern on this matter. Sentoria Themeparks and Resorts Sdn. Bhd. We hope to hear from the Sentoria management regarding our email on 2nd January, this week. We have received news from Langkawi island that there are chimps at Sentoria’s new zoo, Langkawi Nature Park and we believe that these chimps were transferred from Bukit Gambang. However, there are only two chimps at LNP. May we know what has happened to the third chimp? If this chimp is dead, may receive its post mortem report and photos. With reference to the treatment of three chimpanzees at the Bukit Gambang Safari Park, we are forwarding a letter on behalf of the Pan African Sanctuary Alliance [PASA] as per attached in this email. Will the management of Sentoria GB inform us if it will agree to rehoming the chimps to Africa? Our organisation joins the call by PASA to rehome the chimps to Africa. Besides, may we also know the current status of the three chimps? Looking forward to hearing from the management. Thank you. Below are all the emails sent to Sentoria before they replied on 12 July 2018. Since my last email on January 20 [as per below] we have not received a reply from the management to our requests regarding the treatment of the chimps, now at Langkawi Nature Park [LNP]. We hope the Sentoria management will furnish us with the details we have requested previously. In February our organisation contacted several staff members of Sentoria with regards to the alleged shooting of Sumomo the chimp at LNP. The staff contacted refused to comment on Sumomo’s fate and informed us to contact Dr. Adznan, though to our disappointment he never answered/returned our calls and text. Several days after our attempts on getting clarification on Sumomo, LNP finally admitted on its Facebook page that Sumomo has indeed died; albeit from kidney issues. With reference to our request on January 9, can the management please provide photos of Sumomo’s corpse and post mortem report[s]? We are also awaiting evidence [photographic and data sheets] that while the chimps were at Bukit Gambang Safari Park they were given [daily] access to an enclosure. We’re looking forward to hearing from your management. Further to our previous emails, may we know please if the three chimpanzees who were at Bukit Gambang Safari Park were never released into an enclosure while at the zoo, as mentioned in this article in December? If they were may we please receive evidence including photos of the chimps in the enclosure and data sheets? We would also appreciate other information including the diet data sheets of the chimps at Bukit Gambang. With reference to the treatment of three chimpanzees at the Bukit Gambang Safari Park, we are forwarding a letter on behalf of the REDACTED as per attached in this email. Will the management of Sentoria GB inform us if it will agree to rehoming the chimps to Africa? Our organisation joins the call by REDACTED to rehome the chimps to Africa. This gives the impression that orangutans are being rehabilitated at Semenggoh but there is actually no rehabilitation taking place at Semenggoh. What is really happening is massive tourism and it surely does effect the orangutans. Baby Mas and her mother should be living in a forest far away from humans, which means not at the Semenggoh Nature Reserve forest. The International Union for Conservation of Nature (IUCN) discourages tourism involving orangutans once familiar to humans as habituation is associated with physical risk and that of communicable diseases such as tuberculosis and hepatitis. There is also evidence to suggest that unsustainable orangutan tourism (in other words, doesn’t abide by IUCN guidelines) contributes to a higher infant mortality rate. Our estimation is that Semenggoh Nature Reserve is only about 460 hectares (we are open to be proven wrong) despite claims that it is bigger than that, and SFC claims there are 28 orangutans, including 13 females (roaming in the non-contiguous reserve). However, our estimation is that there are only about 10-15 orangutans in Semenggoh. There is also the problem of inbreeding considering the tiny patch of forest. In reality, experts say that a female orangutan uses up to 1500 hectares while males use at least 3000 hectares. Even if Semenggoh is 1000 hectares in size, it is still insufficient to sustain a healthy orangutan population and avoid inbreeding, which will cause the population to plummet. There is no control of breeding of orangutans at Semenggoh. There has also been rumours that there has been no veterinary care in Semenggoh for over 10 years and it will be sold off to a Chinese company. SFC is a for profit corporation. So we question, what is Semenggoh running an orangutan adoption program for? Orangutans should be wild and never semi-wild and orangutan tourism at Semenggoh is all about tourism money and not conservation or rehabilitation. We urge the public to channel your donations towards ethical and genuine rehabilitation centres, the ones which do not allow tourism in or near its centres. If you would like to see orangutans in Malaysia visit wild orangutans in the forest where they are far away from humans, but strictly following IUCN’s great ape tourism protocols. Over here in Malaysia we too of course are working hard on freeing Lasah and we will bring you more updates as our efforts progresses. In the meantime we are raising awareness publicly and we still welcome those who live in Malaysia to join us to campaign for Lasah. Non-Malaysians welcome too. We have materials for you to use and disseminate. Thank you to those who tweeted to make the authorities here aware of Brigitte Bardot’s call for Lasah’s freedom. Over 1,500 of you tweeted! If you haven’t tweeted, please click here to tweet now. From the time and effort we have spent thus far to rally supporters like yourself we’ve got over 7,000 tweets in total for this campaign. Thousands have written to the authorities in Malaysia. We ourselves have protested for Lasah here. And much more really! More updates to come. Thank you for fighting for Lasah alongside us. Like you, we’ll never give up. 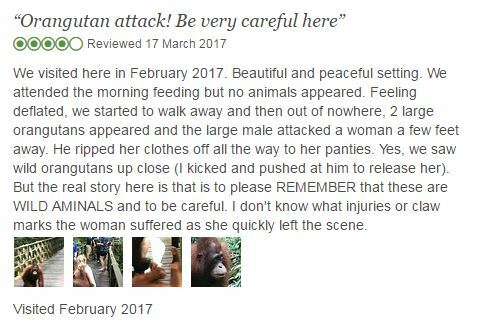 In a Tripadvisor post made by a tourist in March 2017, an orangutan attacked a tourist at the Sepilok Orangutan Rehabilitation Centre [SORC] in the East Malaysian state of Sabah. For years SORC has been a huge tourist attraction when in the first place tourism should not be allowed at all in any great ape rehabilitation centre. The Sabah Wildlife Department [SWD], which manages SORC, is aware that rehabilitation guidelines are being broken at SORC. However, the lure of financial profit at the expense of Malaysian orangutans at Sepilok does have its effect on orangutans at Sepilok. We have contacted the SWD regarding the attack and are awaiting response. Read our media publication on the tragic death of Yoda the orangutan at Sepilok in 2016. Click here to read and share the publication. The video below [not related to the attack] shows a tourist playing with two orangutans. We do not blame tourists for coming into contact with the apes as it’s mostly the apes who approach tourists at Sepilok and tourists are not told what damage they are potential doing to themselves [disease, attacks] and the orangutans. Please click here to know why you should stay away from orangutan rehabilitation centres.